Those wishing to budget their time in the wisest way possible won’t want to miss this tour, as you’ll get to embark on the two most popular Great Wall hikes. We’ll start at Gubeikou, a strategically important of wall that even saw fighting in the 20th century, and we’ll make our way towards Jinshanling, a section of wall long prized for its grace and beauty. 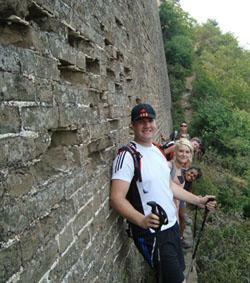 You’re in for a treat, as you’ll actually get to camp overnight on the Great Wall in a watchtower! The next day we’ll make our way towards the western end of Simatai, a portion known for its challenging path. We’ll conclude your tour by hiking Jiankou-Mutianyu, which should provide you with a cornucopia of priceless photos and memories. Like Gubeikou-Jinshanling-west Simatai, Jiankou-Mutianyu makes for a fascinating contrast between unrestored “Wild Wall” and the restored Great Wall with which we are all so familiar with.